Using XVL at Athlete FA The company found that a 470 MB model from the 3D CAD system is just 2.79 MB in size when it is compressed into XVL, a size which was found to be lightweight enough for company-wide use. In addition, composite parts could be accurately viewed with attributes and part numbers to allow correct device configuration. Prior to the adoption of XVL, 2D drawings had been created directly from the 3D CAD system but the resulting drawings were hard to read. 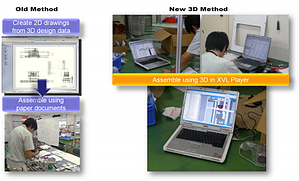 To resolve this, XVL was implemented to deliver assembly instructions and documents using digital 3D data, which is viewed on PCs on the shop floor. Since then, there has been notable growth in requests for additional PCs on the shop floor and new processes for data security have been proposed by the shop floor staff.